Landscape 35, run by Paul Monagham and based in Newcastle, was approached to help redesign the small garden of a newly-built property. Working collaboratively with designer Jo McCreadie from Elmfield Garden Design, Jo and Paul were tasked with creating a low maintenance yet elegant garden. It needed to combine seating, space for entertaining and have the right selection of planting so the clients didn’t need to do any labour-intensive gardening. The existing garden was a blank canvas of turf, bordered by timber fencing, with two sets of French doors leading out from the house. The two companies worked closely together to create and deliver a garden design which would be beautiful to look at and easy to take care of. The square space was enlivened with contrasting textures, different heights of planting and bold paving and grass areas. Paul used charcoal-coloured railway sleepers to build planters of varied heights at key points along the fenced sides of the garden, contrasting them with low-level gravel planting. Shrubs of interesting colours and textures were chosen to contrast with the planters, and artificial grass was used to minimise maintenance. A patio space was carved out, creating an entertaining area, with a sweeping curve of paving leading from the main French doors. Paul used geometric outdoor furniture in the same shades as the planters and brickwork, and added a striking planting feature to give shade and draw the eye. He used two products from our range – Avant-garde paving and Stonespar linear paving – to build the main patio area and walkway down one side of the garden. The client selected Avant-garde in Caramel and Stonespar in the warm Garma blend, which enriched the garden’s palette and provided a textural contrast to the artificial turf. 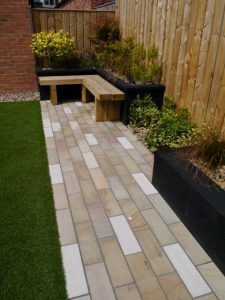 This elegant use of two different Stonemarket products in a single colour palette adds warmth and a modern touch to this garden, and each has been used in a way that highlights their unique characteristics. Our Avant-garde paving in Caramel has a beautifully smooth finish, making it ideal for patio areas which have plenty of use. This particular colour-way is a high quality Indian sandstone; durable, attractive to the touch and with a subtle variegated colour effect. As a contrast, our brand new Stonespar in the Garma blend couldn’t be a better choice. It’s a sleek, premium stone with a ‘ClearBlast’ finish which helps the natural colours shine through, and adds a slight hint of texture. The precision-cut edges mean they can be laid with an almost seamless appearance – shown to great effect in the curve and angles around the artificial lawn in this garden. For more information on product please contact 0345 302 0603. With a restrained use of paving, turf and planting, Landscape 35 and Elmfield Garden Design have produced a low-maintenance garden that looks incredibly high-end, suiting the clients perfectly. The bold choices of materials effectively contrast with each other to enhance the geometric forms of the planters, furniture and paved are-as. 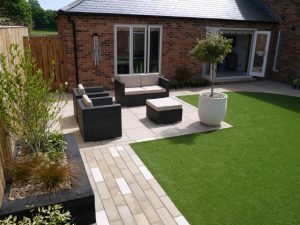 By choosing the rich, natural colour options of our Avant-garde and Stonespar paving, the charcoal-coloured planters and artificial grass are given a visual boost. Through using contrasting square and linear paving, Paul has success-fully divided the garden into different areas, emphasised by the uniquely-shape lawn. The striking planting feature and textured shrubs and ferns soften the crisp angles to make the space stylish yet inviting. The clients commented on the “impeccable standard” of the brick and stonework, which they say “complement the garden design perfectly”. Paul Monaghan, owner of Landscape 35, steered this project with support and collaboration from Elmfield Garden Design. Both companies are based in Newcastle. Landscape 35 specialises in creative and vibrant garden landscaping, often choosing unique curved or geometric forms to shape turfed are-as or planting. They regularly work with Stonemarket products, using the stone to create decorative walkway features or textural contrasts to planted areas. Would you like to find garden designers in your local area? Finding the right one is essential for your investment into a new and beautiful outdoor living space. Visit our website www.stonemarket.co.uk to use our postcode search tool and find local designers in your area – here you can view their previous projects and find the right designer for you. Alternatively, you may be searching for a local landscaper to install your driveway or garden project? If so, try our easy online search tool; simply input your postcode to generate a list of your nearest local installers.